This 68-story tower is Donald Trump's signature building and while it is big and brassy it is also surprisingly subdued. One of the city's premier mixed-use buildings, it has fine detailing and is notable for its thin profiled and stepped massing. By New York standards, it is spectacular and epitomizes many popular visions of successful "lifestyles." Its "sawtooth" plan makes the 644-foot-high tower appear even thinner and creates more corner windows that are more salable although during construction some apartment layouts had to be changed when it was discovered some corner bedrooms "looked" into other apartments' bedrooms. 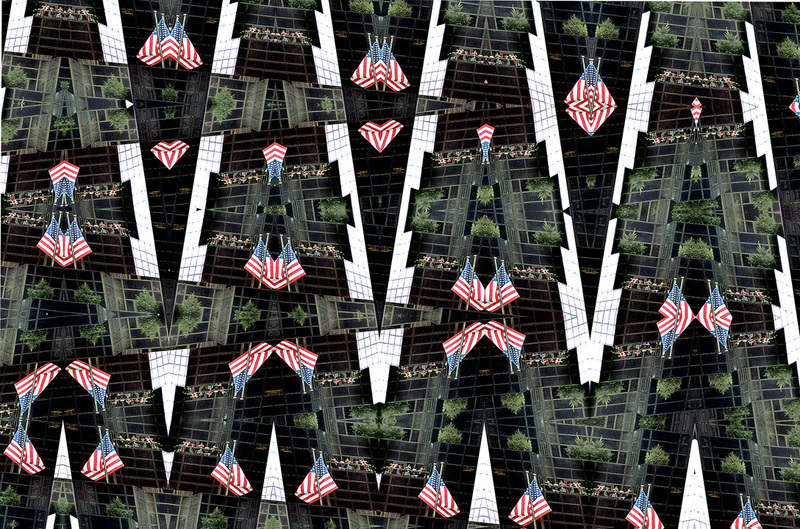 The unusual layout also demonstrated that flat-roof buildings are not necessarily ugly even in a Post-Modern age as from many pedestrian vantage points, the tower's top is zigzag. The waterfall was in front of rose, peach, pink and orange Breccia Perniche marble. 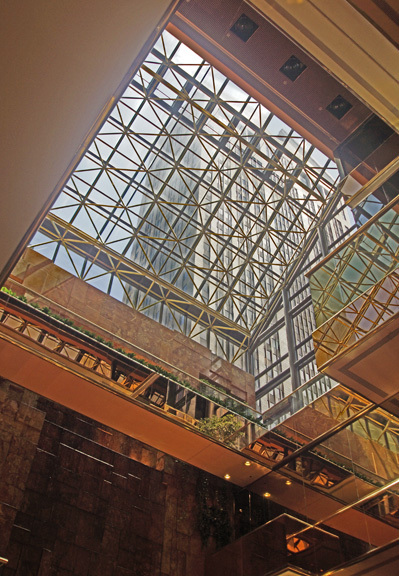 The stepping effect of the tower is thematically continued with the lobby atrium's seven-story waterfall beneath the large, angled skylight. Much of the brightly-lit, 100-foot-high, atrium is lined with mirrors creating visual havoc for the hordes of tourists who ride the criss-crossed escalators to the upper and lower retail floors. There are very handsome outdoor terraces at the top level of the atrium that overlook the great atrium of the former IBM Building on the eastern half of the block and adjoining the Nike Store that replaced the former Galleries Lafayette store that replaced the former Bonwit Teller Store that had relocated to that location after its Fifth Avenue building had been demolished by replaced by Trump Tower. Bonwit's, for decades one of the city's most elegant department stores, relocated to a handsome, new, small, polished red granite building wedged between Tiffany's and the former IBM Building to the east on 57th Street and connected to Trump Tower at several levels in the tower's atrium. It did not. 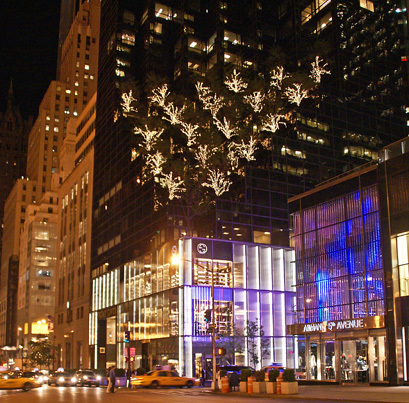 however, survive the relocation for long, however, and was replaced by Galleries Lafayette, which kept the very elegant facade on 57th Street, but which, in turn, succumbed to the vagaries of New York retail competition. In 1996, this small, structure, was replaced by a new retail building for Nike that resembles a large high school building on the outside. Trump's demolition of the modest, but very attractive Art Deco box of the former Bonwit Teller Building on Fifth Avenue designed by Warren & Wetmore in 1929 and remodeled the next year by Ely Jacques Kahn was done before a protest could be effectively waged to preserve from Trump's jackhammers some very good-looking 15-foot-high, Art Deco bas-reliefs on the facade that had been promised to the Metropolitan Museum of Art along with decorative ironwork above the store's entrance. The large, polished bronze frame outlining the lobby entrance of Trump Tower on Fifth Avenue clearly pronounces the tone of the interior, but it also reminds some older New Yorkers of the large and wonderful Art Deco medallions that were lost but should have been incorporated into the new design, perhaps inside the lobby. 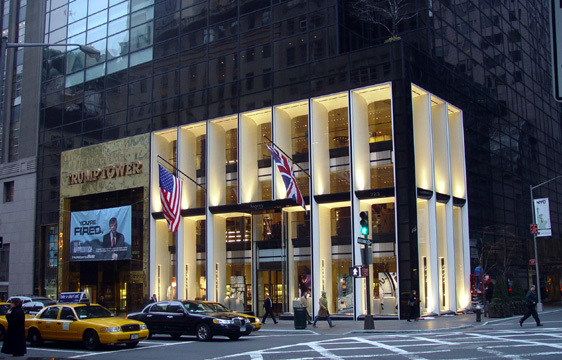 The former Bonwit Teller building on Fifth Avenue nicely complimented the adjoining Tiffany Building before Tiffany's chairman, Walter Hoving, made an uninspired four-story addition to it. In contrast, nothing about Trump Tower is modest. We may rightly lament the passing of Bonwit Teller and the other great bastions of retail elegance such as DePinna and Best & Company that have disappeared from Fifth Avenue. Once the great Savoy Plaza Hotel was demolished to make way for the General Motors Building and once Sheldon Solow built his sloping skyscraper at 9 West 57th Street, the low-rise, turn-of-the-century and Jazz Age-ambiance of this part of town was transformed into a melange of the old and the new. Without Trump Tower, however, the nearby former IBM Building and the Sony Building across the street, might not have been developed. The "Plaza" office district is now the city's best and most desirable and that can be largely attributed to this project. 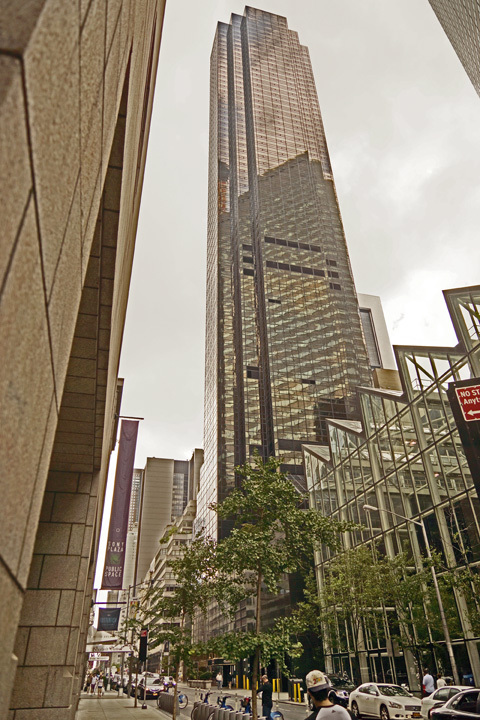 Trump Tower, which was completed in 1983, and the former IBM tower in fact present a superb modern ensemble on this block, especially as they are diagonally positioned from each other. 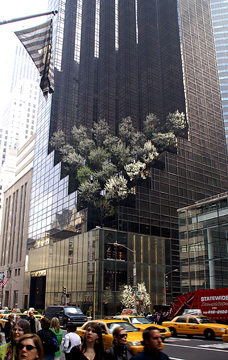 It is too bad that Trump did not use his public relations talents to dissuade IBM from closing its wonderful "gallery" that played host to many important art exhibitions, as well as providing yet another amenity for Trump Tower residents, in its short life. 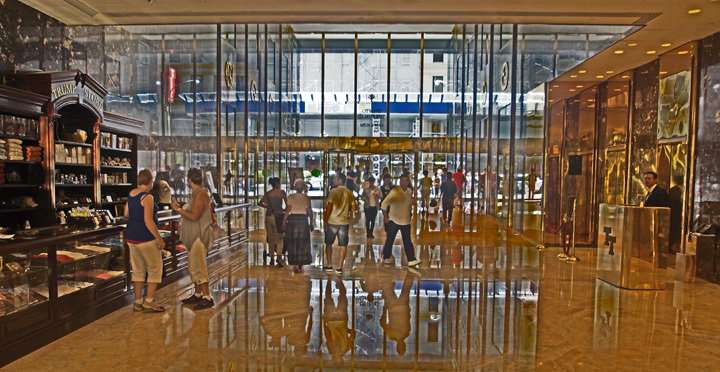 Trump Tower's public Fifth Avenue Tower lobby's polished, regally rosy granite walls and floors and polished brass vitrines and "T"-shaped stanchions are lavishly bright and amusing and manage to just miss being outlandish. 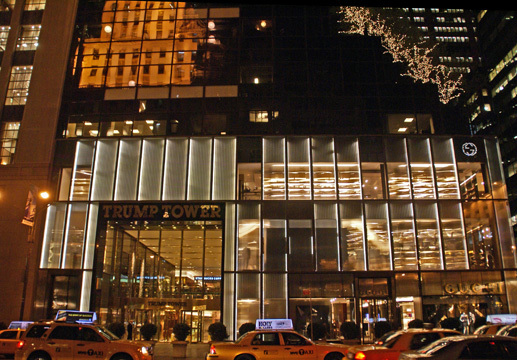 The "T" logo of the stanchions and vitrines is different from the inlaid Trump Tower seal on the slight ramp of the wide Fifth Avenue entrance. The inconsistency of the logo styles is not as puzzling as why immodest Trump chose not to employ them more often, such as in the skylight over the waterfall. The ramp in the lobby is an excellent alternative to steps and enhances the notion of descending entrance and ascending exit. The office elevators are located in this lobby, but the residential condominium apartments have their own, separate, more sedate entrance on 56th Street. The concept of an inner-city, vertical shopping mall has had rough going since the initial success of WaterTower Place in Chicago. This is one of the world's finest and most expensive retail locations and since it was built many other landlords have opted for larger, two-level retail spaces. Public restrooms are in short supply in midtown and where they have been included, often mandated by zoning laws, they are often secluded to discourage use. At Trump Tower they are tucked away on the lower level of the atrium down the south corridor, but they are worth the trip for the angled marble entrance is one of the best designs in this project. The project's glitz is muted by its impressive monumentality. Fifth Avenue's legendary limestone detailing had long before been blunted/bashed/interrupted by Olympic Tower several blocks to the south and the high-rise quality of Trump Tower is perhaps the best in midtown. 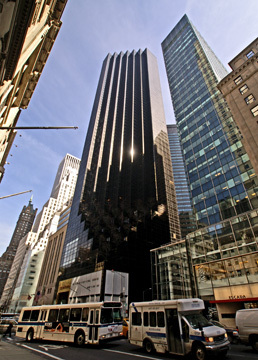 Trump opposed the plans of Alfred Taubman and Edwin Minskoff to erect a tall tower at 712 Fifth Avenue across from his tower, presumably because it might interfere with some midtown views in many apartments. The other tower got built anyway and is one of the city's best and Trump Tower has hardly suffered as most of its apartments have stunning vistas, and prices. Trump maintains his office here as well as occupying the penthouse opulently designed by Angelo Donghia. In 1985, Gwathmey Siegel & Associates designed an apartment in the tower for Steven Spielberg, the film director. 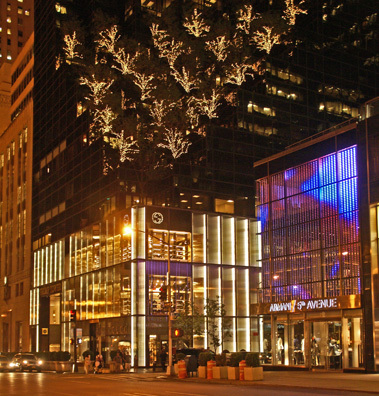 In 1998, the Fifth Avenue facade above the entrance was altered to accommodate a two-story-high sign for "Avon". The sign has gray letters against a cream background and is behind clear, not bronze glass windows. The Avon name actually became more prominent than the Trump name in bronze just above the entrance. Was Donald asleep in his quite rococco, palatial lair in the tower, or on vacation? The Avon sign detracted from the building's ambiance and architectural design. It was not unelegant, just strange. After all, what is Avon compared to Trump, at least in New York? 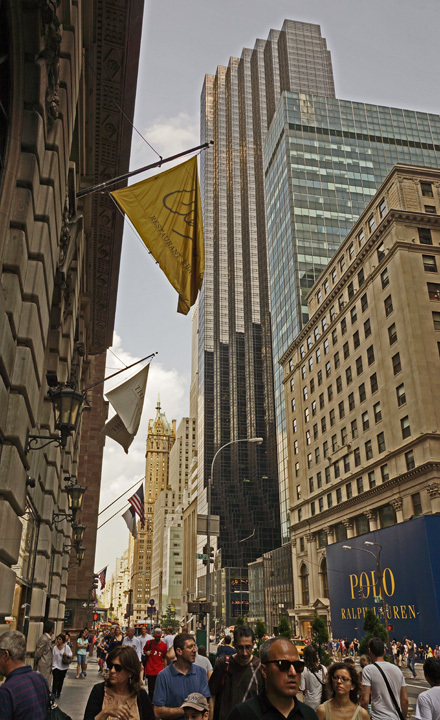 In September, 2000, Mr. Trump took out some full-page advertisements announcing that he would be happy to emblazon the name of a retailer in a large brassy sign just beneath the first setback of Trump Tower at the corner of Fifth Avenue and 56th Street. Was one to interpret this as a a new age of Trump modesty in which he lets others have almost equal billing? Was this a sign that Time Squaritis and billboarding is spreading and contagious and that all buildings will be emblazoning with billboards of one type or another? Was Trump running short of cash? Whatever the answer, both the Avon sign and any new "sign," brass or not, was not in keeping with the building's quite fine design and Donald should have left well enough alone. This is not a question of context, but taste and it is all the more strange because Trump is doing it to himself. In early 2004, Asprey reopened its corner store in the tower with a redesigned storefront, designed by Sir Norman Foster. It was very elegant, very white and very bright, in keeping with recent trends towards multi-floor retail spaces along the avenue. It had little to do with the bronze Trump Tower but was impressive enough not to despoil it. 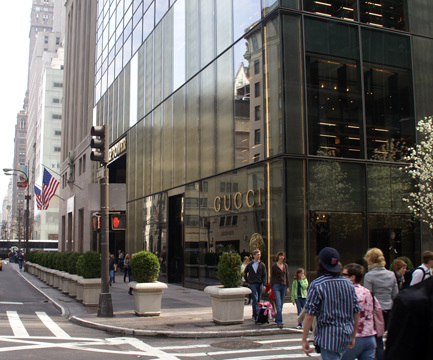 Unfortunately, it did not last long and in 2007 Asprey had located uptown on Madison Avenue and its space was leased to Gucci, which replaced Foster's bright window treatments with one that was ribbed and translucent in 2008. 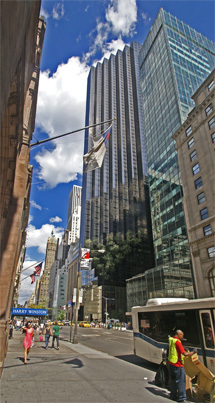 Trump Tower, which has 12 floors of offices and 40 floors of apartments and a Floor-to-Area (FAR) ratio of 21, is triumphant because of its location, its views, its architecture, and its flair. Swanke Hayden Connell was the architectural firm and Der Scutt the lead designer. Equitable Life Assurance Society of The United States was the co-developer.